Now One Man Wages W.O.W. little marvin will not stop cutting hearts all over the world until war ends. Forever. Inspired by a family member's ordeal in the terrorist attacks on Mumbai, this modern-day Johnny Appleseed subscribes to the same 11-point manifesto as terrorists - with a mission to inspire others to love with the same passion, devotion and energy that terrorists give to acts of terror. And now, little marvin is inspiring people everywhere to cut, sew and wear golden hearts of their own with two February launches: little marvin loves you! 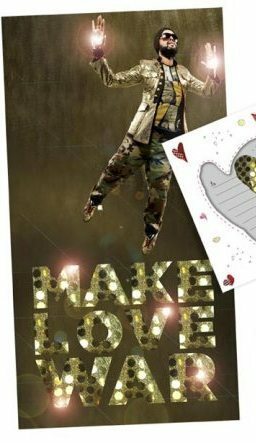 Heart Transplants on Feb. 7, and the Valentine's Day debut of his multimedia event MAKE LOVE WAR. little marvin explains how he was inspired to cut golden hearts until war ends with his personal story: "Thanksgiving Day we woke to find out that a beloved family member was caught in the crossfire of the Mumbai attacks", says little marvin. "The cruelty and horror she witnessed for 16 hours in a hotel was beyond comprehension. Luckily for our family she made it out alive. Other families were not so lucky." People respond to tragedy differently. Some retreat, others lash out. little marvin's response surprised even him. "I began to cut gold hearts and sew them to the sleeves of my shirts. It just seemed like the right thing to do at the time. Like a meditation, in a way; a simple reminder of where to lead from." But when friends, colleagues and even strangers on the street began asking for gold hearts of their own, little marvin realized their potential was greater than he originally intended. "It wasn't calculated on my part, trust me. These are die-hard New Yorkers we're talking about. No one wants to be the dude with gold hearts on his sleeve on a crowded subway." "But", he continues, "It's usually the most simple act that allows a person to access their deepest humanity. Any act, no matter how small, when done with intense purpose and devotion, can be transformative. By that rational, cutting hearts can end war. It is truly that simple." February 7th - little marvin loves you! Heart Transplants available at littlemarvin.com, Bloomingdale's and select stores nationwide. Two matching gold sew-on hearts packaged in ready-to-send, colorful cards and envelopes with whimsical illustrations and quotes, little marvin loves you! Heart Transplants make the perfect, affordable gift for Moms or Dads to give their daughters and for sisters or best friends to exchange. "This effort will continue until war is over", says little marvin, "A giant capsule called HeartBomb, complete with a countdown clock, will collect the hearts for the event's travels around the world. The clock will stop once all war on earth has come to an end. At that point it will be buried. I'm hoping this show has a short life."